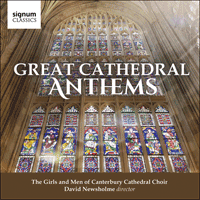 Infusing the hallowed spaces of Canterbury Cathedral with their singing for the first time in 2014, the Girls here join the Men of the Cathedral Choir in a sequence of anthems from Tallis and Byrd to Howells and Leighton. Little is known about the early life of Thomas Tallis (c1505-85), but his musical appointments at Dover Priory (his first employment) and, later, at Canterbury Cathedral have led to speculation that he was a native of Kent. In 1540, upon the dissolution of the monasteries, he lost his job at the Augustinian Waltham Abbey in Essex—actually the last monastery to be dissolved. However, soon afterwards he joined the choir at Canterbury Cathedral as a Lay Clerk, an association which lasted from 1540-43. He then served in the royal household of Henry VIII. Within a period of just over ten years Tallis had progressed from his first, humble appointment—organist of a Benedictine priory at Dover—to a most exalted position as one of the Gentlemen of the Chapel Royal, in which it is believed that his principal duties would have been—apart from singing—playing the organ and regularly providing compositions. He remained in this post until his death. Two royal acknowledgements indicate Tallis’s status—in 1557 Queen Mary granted him the lease on a manor house in Kent, providing good income, and in 1575 Queen Elizabeth granted Tallis and his pupil William Byrd a 21-year monopoly on the printing and publishing of music. William Byrd (c1537-1623) is generally regarded as one of the very greatest of British composers, his very wide gamut of expression and complete mastery of everything he touched being equally remarkable. Among his contemporaries, only Lassus (from the Low Countries) rivalled his range and versatility. A broad view of Byrd’s church music reveals a striking difference between his Protestant and Catholic works—the Protestant with English texts, and generally simple enough to allow the words to be clearly heard, the Catholic with Latin texts, set to music of much more elaborate technique. Byrd’s predicament as a Roman Catholic in the alien environment of the late 16th century may well be compared with that of Shostakovich working—or rather, performing a dangerous balancing act—as a composer within the Soviet Union. As Joseph Kerman has written, we may well imagine that Byrd was expressing through his religious music 'prayers, exhortations and protests on behalf of the English Roman Catholic community'. Written for the feast of Corpus Christi, the motet Ave verum corpus is judged to be among Byrd’s very finest works. This intimate piece is the fifth of the 4-part compositions in the collection Gradualia I, published in 1605. In his Gradualia I and Gradualia II Byrd intended to provide music for all the mass Propers of the church calendar. As Kerman has observed, the text Ave verum corpus 'never achieved formal liturgical status'. Its arguably superfluous inclusion in this collection is significant, because these words would have made an important doctrinal point for Catholics in Byrd’s time, for whom transubstantiation was a lively controversial issue. Born in Nether Ettington, Warwickshire, William Croft (1678-1727) was educated as a 'Child of the Chapel Royal' where he was taught by John Blow, subsequently sharing the post of 'Gentleman' organist with Jeremiah Clarke. When Clarke committed suicide in 1707, Croft became Composer and Master of the Children at the Chapel Royal. John Blow died a year later and Croft succeeded him as organist of Westminster Abbey. Croft’s most celebrated work is a 2-volume church-music collection entitled Musica Sacra, containing 31 anthems and the Burial Service. It is primarily this collection which has sustained Croft’s reputation. The Burial Service has been performed at every state funeral since its publication, including that of the Queen Mother in April 2002. Croft’s occasional anthems are among his finest works. We will rejoice in thy salvation (text from Psalm 20) has exuberant outer sections and a poignant middle section with some chromaticism in the melodic line. The son of a clergyman, Maurice Greene (1696-1755) was born in London and became one of Jeremiah Clarke’s choristers at St Paul’s, where subsequently he was appointed organist. On the death of William Croft in 1727, he became organist of the Chapel Royal, then Professor of Music at Cambridge University (1730) and five years later he was appointed Master of the King’s Musick. Lord, let me know mine end, a setting of verses from Psalm 39, is generally recognised as Greene’s finest composition. A treble duet at its centre is framed by music of expressive power above a perpetual walking bass which suggests ones journey through life. Charles Villiers Stanford (1852-1924) was born in Dublin and educated at Cambridge University, before studying music in Leipzig and Berlin. This German period is undoubtedly connected with the strong Brahmsian influence—in particular his consistent craftsmanship—evident in much of Stanford’s orchestral and chamber music. He was prolific, composing nine operas, seven symphonies and much chamber music. The most enduring part of his output, however, is his fine church music, which has always been highly regarded. Stanford was a first-rate teacher whose pupils included Vaughan Williams, Holst, Howells, Ireland and Bliss, while his importance in the revitalisation of British music, generally raising standards administrative, pedagogic and practical, should not be underestimated. He was knighted in 1902. Although Stanford’s 3 Motets Opus 38 were not published until 1908, they probably date from around 1892. Its text extracted from The Wisdom of Solomon (or The Book of Wisdom), Justorum animae is essentially peaceful and contemplative, though its middle section, more strenuous and rising to a fortissimo climax, evokes malice ('et non tanget …'). The subject of the medieval hymn Caelos ascendit hodie is the Ascension. In this contrastingly joyful piece, Stanford employs two choirs for dramatic antiphonal effect, with many trumpet-like Alleluias. The Ascension itself is simply evoked by the long, rising soprano line at the final Amen. Beati quorum via (Psalm 119, verse 1 providing its very brief text) is scored in six parts, with divided sopranos and basses. Marked 'with tranquil movement', this is an exquisitely beautiful piece, while the complete group of motets is among the most outstanding of Stanford’s many works enhancing the repertoire of the Anglican Church. Born in Bournemouth, Hubert Parry (1848-1918) was—like Stanford—one of the pillars of the British musical establishment at the time of the so-called English Musical Renaissance. Such figures were overshadowed by the emergence of Elgar’s genius, but their importance should not be forgotten. Like Charles Ives, Parry pursued—much less successfully—a career in insurance, but it would be his demanding duties in musical academe which limited his time for composition. Again like Stanford, Parry was a highly regarded teacher, sympathetic and broad-minded, whose pupils included Vaughan Williams, Holst, Ireland and Bridge. He was knighted in 1898. Parry composed his celebrated I was glad when they said unto me for the coronation of Edward VII in 1902, but revised the introductory section for the coronation of George V in 1911. The text comprises verses from Psalm 122, although in the central section Parry originally interpolated the words 'Vivat Rex' or 'Vivat Regina'. Subsequently, this splendid anthem has become an essential part of the coronation service of British monarchs. William Henry Harris (1883-1973) is best remembered as a choral trainer. Born in Fulham, he became assistant organist of St David’s Cathedral in Wales. A succession of organist appointments followed—St Augustine’s Church, Edgbaston, Lichfield Cathedral, New College Oxford, Christ Church Oxford, and St George’s Chapel Windsor in 1933. As organist/choirmaster at Windsor, a position he held until 1961, he was involved in the musical education of the teenage princesses Elizabeth and Margaret Rose. Harris conducted at both the 1937 and 1953 coronations and he was honoured with the KCVO in 1954. Not a very prolific composer, Harris is best known for his Anglican church music. Bring us, O Lord God (1959), a harmonically rich and unpredictable setting of inspiring words by John Donne, scored for double choir, is a strikingly beautiful addition to the Anglican repertoire. Herbert Howells (1892-1983) was born in Lydney, Gloucestershire. Aged twelve, he began music lessons with the organist of Gloucester Cathedral, Herbert Brewer, and four years later became his articled pupil at the cathedral. In 1912 he became a student at the Royal College of Music, where his teachers included Stanford, Parry and Charles Wood. 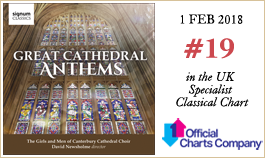 Although the large-scale works Hymnus Paradisi and Stabat mater are probably his greatest works, his large output of Anglican Church music has proved to be of enduring quality. Like as the hart desireth the waterbrooks (verses 1-3 of Psalm 42) is the third of Four Anthems, composed in 1941. Marked 'with quiet intensity', the piece is characteristic of Howell’s reflective, unostentatious language. The opening section is tinged with some expressive chromaticism, the flattened mediant imparting a suggestion of 'blues' flavour. The organ has brief interludes and also concludes the piece after the choir has sung its serene final cadence. Kenneth Leighton (1929-88) was born in Wakefield, studied at Oxford (Classics and music), then with Goffredo Petrassi in Rome. He held teaching positions at Leeds, Edinburgh and Oxford Universities, before returning to Edinburgh as Reid Professor of Music. His composition list—covering most genres—extends to more than a hundred works. Commissioned for St. Matthew’s Church, Northampton, and first performed in September 1965, Let all the world in every corner sing is a setting of the uplifting words by George Herbert. Leighton’s syncopated and relatively dissonant version is worlds away from the familiar hymn-tune by Basil Harwood, but equally celebratory.